BellaRoma Hostel is a new place in Rome designed for young low budget travellers. Established on December 2004, BellaRoma Hostel is a sister of Pensione Ottaviano Hostel and Sandy Hostel and the same quality is guaranteed. The hostel is located in a pleasant, quiet area, only a short walk from St. Peter's Square. It is a clean, economical place to crash close to the Vatican and several other main sights with several transport options available. 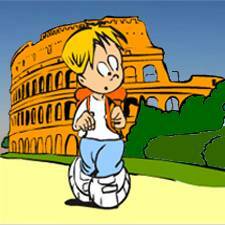 Our international atmosphere and energetic, friendly English speaking staff help make us one of the most popular hostels in Rome. We help our guests enjoy their stay in Rome by providing necessary information on tours, maps and other tourist information. The hostel is easily accessed from Termini Central Station , just a few stops on the Metro (Line A), and from the airport. Our hostel will only accept guests arriving and checking in before 21.30pm. We would like to remind you that your arrival must be within 3 hours of the time which you indicated when booking. Also, We remind to You that Your arrival at the hostel must anyway be before 21H30 p.m.
Reservations with an indicated arrival time after 21.30 pm will be immediately canceled. Upon arrival at the hostel, you must pay the full balance due IN CASH immediately. Changes or alterations to your reservation cannot be made at your check-in. We do not support change or alteration of the original reservation. To alter or change your reservation, you must cancel the original reservation and rebook once again. We do not accept reservation changes or alterations by e-mail or by phone. Cancellations must be made ONLY BY E-MAIL at least 72 hours (3 days) prior to your arrival date. If adequate notice is not received, we will unfortunately have to debit your card. The amount charged will be your first night's accommodation. We are unable to send mail or fax letters for visa documents applications. We do not accept customers under 13 y.o. and over 40 y.o. for dormitory accommodations. All ages are accepted for private rooms. Check-in service: 7:00am - 21:30pm. We don't refund the deposit and the booking fee paid for any reason. Take the train direct to Termini. (train station) As you get off the train, turn left (exit on via Giolitti) where you will find bus stop nr 70. Ride it to the end station, Piazzale Clodio. Take metro line B (direction Laurentina). Get off at the Termini Station and then follow the previous instructions. Take the Blue Cotral Bus that runs every half hour to Anagnina. From Anagnina take the metro line A to Termini and follow previous instructions. Take metro line A (direction Battistini) to Ottaviano and walk down via Giulio Cesare towards via Leone IV where you turn right and get on bus 23 which will take you 3 stops down the street to the end station Piazzale Clodio or take a short walk. Please note: when you get Piazzale Clodio, look, then go to the Mitsubishi dealership where you will find the right hand side a deadend street. The hostel is at the end of the deadend street (Via Accinni) at the number 63.